The Bad: The film is about 30 mins too long (run time of about 2.5 hrs) The plot really wasn't that deep, and the big twist at the end is pretty predictable. There seems to be two big climatic points in the movie. Once the first one is over(the big train scene), that's when you'll start to realize just how long this movie feels. Also, since the story is being retold within the movie, there are some choppy points, that may make it a little hard to connect the dots of the story. The Reason: I didn't grow up watching the Lone Ranger, but I suspect that those who did will appreciate this movie much more than those who didn't. This wasn't a bad movie, but it just wasn't exciting or even suspenseful. It was entertaining, but nothing I'd center my entire night around. I also don't think that this movie will be making people fall in love with Westerns again, but instead just have a few nostalgic moments. 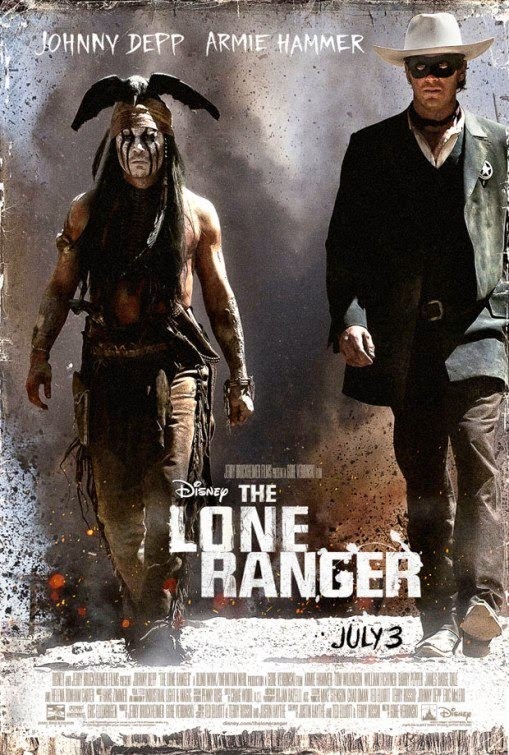 (Especially when they play the Lone Ranger theme music) I'm not sure just how "kid friendly" this movie is because there is some killing and even cannibalism. (so parents just be advised) Rent this, and if you're desperate to see it, make it a matinee watch.